CAMI Research Inc. (Acton, MA) announces an addition to its CableEye cable and harness testing system suite, specifically to the HV product line. The HVX-21 extends the HiPot test voltage range to 2100 Vdc and 1200 Vac permitting detection of even more subtle defects. 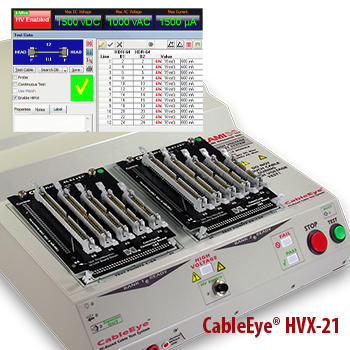 Introduced at the 2015 Wire Processing Technology Expo, the HVX-21 differs from the HVX in having 40% greater maximum DC, and 20% greater maximum AC test voltages. In addition, the current sensitivity is 5x higher allowing detection of the same insulation resistance at far lower voltages to minimize the risk of insulation or surface damage. These extended range capabilities permit testing to meet many of the more stringent requirements of commercial and aerospace applications. Like the HVX, the HVX-21 easily handles all electrical testing requirements of the IPC/WHMA-A-620B guidelines, in addition to the most exacting reporting requirements of government-contracted and ISO 9000-style certified companies. Expansion module (Item 828), +128TP/module attaches in a stacked configuration. 4-Wire Kelvin test feature (Item 832) for expanded testing of contact and wire resistance to as low as 1 mΩ. Helps reveal cold solder joints, faulty crimps, recessed pins, pin contact contamination, improper wire gauge, and stress-extruded wire. HV remote socket (Item 829X) for extending HV emergency stop, and HV-Enable function to an external, custom-designed panel used when mounting the system in an inaccessible cabinet. The HVX-21 (Item 829A) is $7995 (Domestic US Price), and includes CableEye’s standard one year Warranty which is combined with free tech support and free software upgrades.